In addition to editing individual points, Insight also allows the arbline to be moved as a whole. 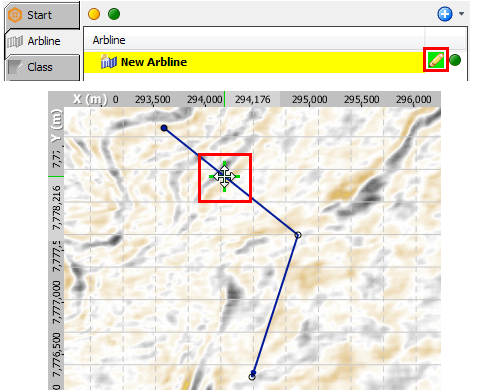 You will see the entire arbline updated on-the-fly in the arbline/3D view (see Viewing Data Along Arbline). To move an arbline, first click the Pick arbline pencil icon to enable editing of the arbline. Alternatively, you can right click on the arbline and select Pick "Arbline" from the context menu. With editing enabled, hover the mouse cursor over the arbline until the cursor changes to the Move icon (see image above). Click on the arbline and drag it to another location. Note: Arblines snapped to 2D lines will issue a warning to unsnap the arbline before the move will be completed. Arblines can also be projected from the original arbline location in the Arbline View to view volume information at incremental locations without losing the original arbline (see View shifted arbline (offset by distance)).